Like the rest of Southern California, the automobile is the most popular way to travel around San Diego. So, it shouldn't be a surprise that San Diego traffic conditions can get hectic at times! Our highway system has more than 300 miles of freeways and about 7,150 miles of streets and roads. San Diego traffic reports indicate that more than 68 million vehicle miles are traveled daily in the region, with an average vehicle trip length of 5.8 miles. With a population of about 3,100,000 people, the San Diego area has two miles of roads per thousand people - about the same ratio as Los Angeles. The total freeway lane miles is about 1,875 with average daily San Diego traffic per freeway mile of 20,027 - about the same as San Francisco. Want more information on live San Diego traffic conditions? Click here for the CALTRANS live San Diego traffic alert. San Diego traffic reports show that we spend an average of about 54 hours a year sitting in rush hour traffic - 20 percent more than just two years ago. However, compared with other large cities, the traffic in San Diego moves along pretty well. In a recent study of traffic congestion in urban areas, San Diego ranked 11th out of the 39 major metropolitan areas for annual hours of delay, performing better than Atlanta, Chicago, San Jose, Houston and Los Angeles. Click here for San Diego traffic accident information. With all the San Diego County highways and major arteries, you can always find optional routes to reach your destination. The best way to get the upper hand on traffic congestion is to view this San Diego traffic report before you get into your vehicle. Here you can see the latest San Diego traffic report, the average speed of traffic on your route, the location of traffic congestion and accidents, as well as the average traffic speed on alternate routes. The Census Bureau says that of the more than 1.4 million workers in San Diego County, 94 percent commute and the balance work at home. Of those who commute, 90 percent use a truck, car or van to get to work. This means that San Diego traffic conditions can get really hectic during the prime commuting hours. Here's how it stacks up. 10 percent of San Diego workers leave for work between 5 and 6 a. m. - 21 percent between 6 and 7 a. m. - 25 percent between 7 and 8 a. m. - 17 percent between 8 and 9 a. m. - and the balance at other hours. How much time do workers spend in San Diego traffic? For more than two out of three commuters, getting to work takes less than half an hour. 6 percent drive 60 minutes or more - 6 percent drive 45 to 60 minutes - 21 percent take 30 to 44 minutes to commute - 24 percent have a commute time of 20 to 29 minutes - 32 percent take 10 to 19 minutes to get to work and 12 percent have a drive time of 9 minutes or less. I always encourage my clients to buy a home near where they work. There are many fine neighborhoods throughout San Diego County and downtown is a bustling, thriving place to live. With the average cost of driving an automobile at .67 per mile, it may be wise to spend more for a home that's located near your work - not to mention the value of your time and peace of mind! Search data from the San Diego MLS to find a home located closer to your employment. 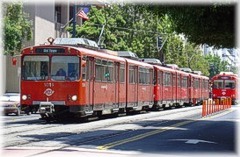 The San Diego Trolley is worth using if you travel around downtown San Diego and/or to and from the East County communities including SDSU. Expansion of the San Diego Trolley from Old Town to the UCSD campus and the UTC Shopping Center is in the planning stage. The Amtrak system offers 12 daily trips between San Diego and Los Angeles. Also, it's another great alternative to driving from the coastal cities to downtown San Diego on the weekend. Plus, the SPRINTER mass transit rail line runs 22 miles along the Highway 78 corridor. 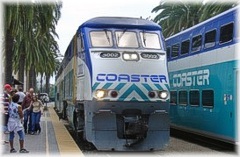 SPRINTER service includes 64 trains per day stopping at 15 convenient stations between Oceanside, Vista, San Marcos and Escondido including Palomar College. SANDAG, a regional planning group is working with local, state and national agencies to improve San Diego traffic conditions. They manage the TransNet money, the half-cent sales tax dedicated to regional transportation improvements. Between 1988 and 2008, $3.3 billion was generated and an additional $14 billion will be created from 2008 to 2048. Highway list outlines new highway construction projects that will help improve San Diego traffic conditions. Highway map gives an interactive view of how new highways, roads and mass transit will improve San Diego traffic reports in the future. New roads are not always the answer! As promising as it is to think about new and wider highways, that may not be the best answer to San Diego's traffic problems. Studies indicate that widening highways is only a temporary solution to reducing traffic congestion. That's because new roads fill up soon after they open. A recent traffic report by U. C. Berkeley concluded that 90 percent of new highway capacity added to California's metropolitan areas is filled within four years, and 60 to 70 percent of all new county highways are filled within two years of completion. The phenomenon known as "induced traffic," means that new and wider highways actually create additional traffic above and beyond what can be attributed to population increases and economic growth. Reports estimate that two-thirds of the growth in San Diego traffic in the coming decades, will be attributable to "induced" demand. Studies of "Induced traffic" show that when additional roadway space is made available through highway widening or new road construction, drivers often abandon car pools and public transit. This creates additional trips and more San Diego traffic. Also, the more convenient access to expanded transportation routes encourages commuters to live further from work, fueling even more traffic demand. We've seen this most dramatically in the commute to downtown San Diego from Temecula on the I-15 and from Oceanside on the I-5. What else causes San Diego traffic congestion? In the 1950's more than half of San Diego school children walked or bicycled to school. That number has fallen below 10 percent as streets have become wider and more dangerous. This trend combined with the loss of school bus service, has resulted in an overwhelming increase in parents driving their children to and from school. San Diego traffic reports show that 20 to 25 percent of rush hour traffic on local streets is now attributable to the school commute. Motorists talking on cell phones and texting messages crawl about 2 mph slower than drivers not on the phone. 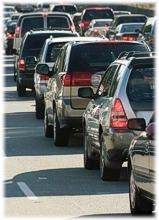 If you commute in San Diego traffic for an hour per day, this can add about 20 hours per year to your drive time. The National Academy of Sciences study found that drivers on cell phones tend to get behind slow drivers and they change lanes 20 percent less than drivers not on the phone. Overall, cell phone drivers take about 3 percent longer to drive the same San Diego traffic-clogged route. Since as many as one in 10 drivers are on the phone, it can really add up.